Food Adventures of a Comfort Cook: What’s Black and White, and Found in a Bakery? What’s Black and White, and Found in a Bakery? 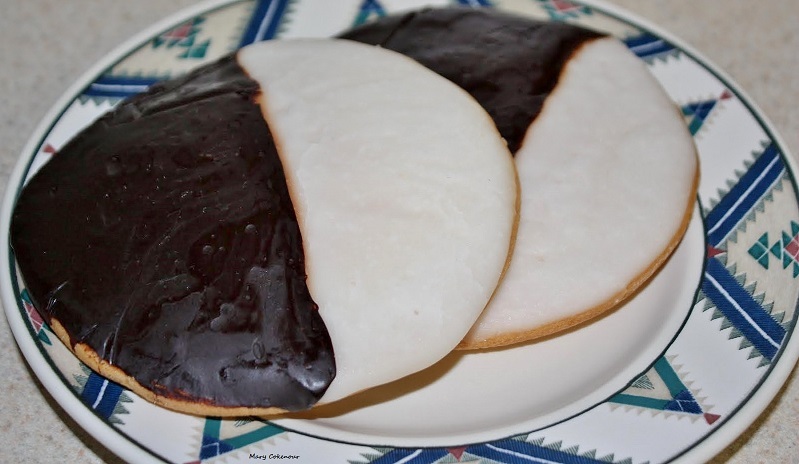 If you’re from the tristate area of New York, New Jersey and Connecticut, and let’s throw Philadelphia, PA in for good measure, you don’t even have to think twice about what the answer to this riddle is…Black and White Cookies. While it was debated whether it is a cookie or a cake; in 1998, columnist William Grimes, of the New York Times, finally defined it as a “drop cake”. In his article, “Look to the Cookie: An Ode in Black and White”, Grimes tells the tale of its origin, Glaser Bake Shop on First Avenue near 87th Street where they’ve been making black and whites since 1902. Growing up, and working, in New York City, every bakery worth its flour made them; they’re as popular for breakfast as bagels with cream cheese and lox. 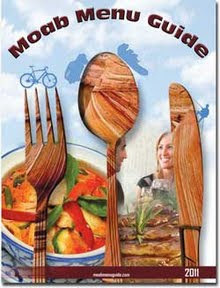 Moving out to Utah, well like I keep telling folks, the only thing I truly miss from the east coast is the food! I tried ordering some online, but the shipping costs were just too high; so who came to the rescue, but my mother. She was able to find a supply of them at her local supermarket (small ones in a plastic container; large ones individually wrapped), and send them via priority mail. Receiving the box, opening it and discovering these treats; it was like hitting the lottery big time! I ripped open one of the containers of small black and whites, and ate three; oh the pleasure was indescribable. Now what the heck is a Black and White Cookie you are asking, if you’ve never had one. Well, it’s a large round vanilla, as Grimes describes, drop cake made from a thickened cupcake batter; one side is white (vanilla) fondant, the other is black (chocolate). If you’ve seen cakes that have those perfectly smooth sides, when cut the frosting barely moves away from the cake; yes, that’s fondant. Fondant is a thick frosting that can be softened up enough to spread like frosting; then firms up to remain on the item it has covered. Or it is rolled out into a thin sheet, placed on a cake and pressed to form a seamless covering. The fondant frosting, once dried and firm, will have the same shiny consistency that rolled out fondant has; it’s just easier to get on the cookie when spread as a frosting. That’s the best way I can describe black and whites; you’ll just have to eat one to truly understand. I know many readers are bakers, so here’s the recipe to try. Fondant powder and fondant sheets can be found in larger supermarkets, in stores that supply cake decorating supplies or ordered online, if not inclined to make it totally from scratch. Pre-heat the oven for 350 degrees. In a large mixing bowl, medium-high speed; beat together the sugar, shortening, butter, and salt; add in nonfat dry milk and corn syrup; cream together. Gradually add in one egg at a time until mixture becomes fluffy. In a large bowl, combine the cake flour and the baking powder in a separate bowl. Add 1/3 of dry ingredients plus 1/3 cup of water to creamed batter. When well incorporated, add 1/3 of dry plus other 1/3 of water; when well mixed, add last of dry ingredients and mix well. Using two cookie sheets, nest one cookie sheet inside the other to make a double-thick cookie sheet; line the top cookie sheet with baker’s parchment paper. Hint: For a guide, draw 3” circles on one side of the parchment paper with a pencil; place pencil side down on cookie sheet. Spread batter over the 3” circles; make sure thickness is even (1/4” will puff up to ½” thickness). Bake for 18 minutes; remove cookies to wire rack to cool. Put tap water in the bottom of a double boiler and bring to a simmer. To the upper part of the double boiler, add the fondant powder, ¼ cup cold water and vanilla Keep extra cold water nearby as fondant tends to be a dry frosting; without sufficient water the frosting will dry too fast, harden, and crack on the cookie. When the ingredients are well blended and thin (it should run slowly off of a spoon), frost one half of the cooled cookies; set aside to allow the frosting to harden. Follow the directions for the vanilla fondant, but include the chocolate chips. When the frosting is melted and well mixed, frost the other half of the cookies. Make sure the vanilla frosting has set before starting to frost them with the chocolate frosting. Let the cookies continue to set on a wire rack. When the frosting is no longer warm and pliable, you can store the cookies individually in food storage bags or wrapped in wax paper.